It’s Delightful-E Simple To Save! P10,353.98!!!! That’s how much I could save if I use an Electrolux Time Manager Washing Machine to wash all our laundry instead of sending them to the shop. What would I do with 10K? Want to know how much YOU could save on laundry expenses? 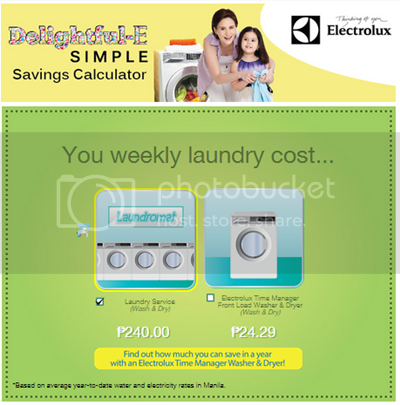 Check out the Electrolux Savings Calculator app. 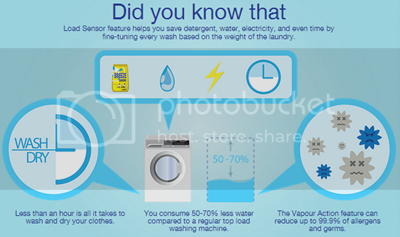 It will show you just how much you spend on your laundry weekly and how much you can save in a year if you use an Electrolux washing machine. 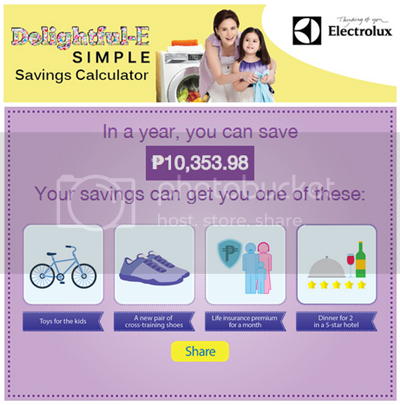 Click here to try the Electrolux Savings Calculator app. Remember to hit the SHARE button after you get your results. Tell your friends on Facebook what you would do with your total laundry savings, use the hashtags #DelightfulE #SimpleToSave, and get a chance to WIN your very own Electrolux washing machine. Contest ends on September 30 so JOIN NOW!!! The 10K savings I mentioned above is just from laundry expenses. Imagine how much more I could save by cutting down on other expenses! The bulk of our monthly expenses goes to food, transportation, and electricity. Though they all are necessities, we can still cut back on them. One of the ways we’ve cut down on food expenses is eating out less often. That also includes dialing 8-7000 or 8-6236 less often. I’ve also been buying meat, produce, and fruits from the wet market instead of the supermarket. They’re not only much cheaper, they’re also much fresher. The best way to lower electric bills is to make sure that all your appliances are running in good condition. Some may think it frugal to keep an appliance for as long as it’s working but if you’ve been using it for more than a decade it won’t be running efficiently anymore and is costing you more on electricity. When buying new appliances, make sure you choose ones that are energy-efficient. Look for the Energy Star logo, inverter drives, and eco-saving features. Another way to lower energy consumption is to unplug appliances that are not in use. Before going to sleep, unplug televisions, microwave ovens, modem and wifi routers, and all other appliances you won’t be using for the night. You’d be surprised how much you’d end up saving in a year. If you’re up to the challenge of riding the jeepney and LRTs, public transportation is still the cheapest way to get to your destination. It’s not that comfortable though and if you’re with little children, it can be quite dangerous (imagine having a little child in a cramped rush-hour MRT – he could get squished and suffocate!). One option to save on transportation costs is to carpool with co-workers. To lessen gas expenses, my husband sometimes uses his motorbike going to work. On days when he’s using the car, he uses apps like Waze to determine the route with the least traffic. My grandfather once told me that it’s not greedy to want a comfortable life, to reap profit from a business, or to save as much as you can. By making sure that your basket is full, you would have more to share with those in need. Work hard, save for the future, and share your blessings.